Happy Halloween from One Small Child! 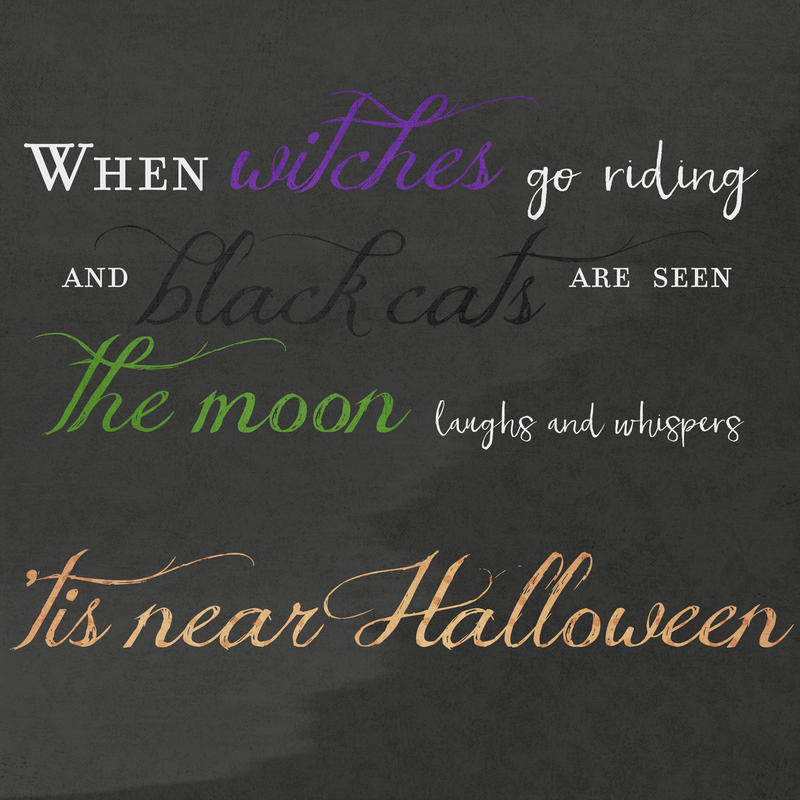 Wishing all your little trick-or-treaters a safe and spooktacular Halloween! I’m afraid we only have tricks this year… At each photo shoot, we inevitably end up with a few funny looks. 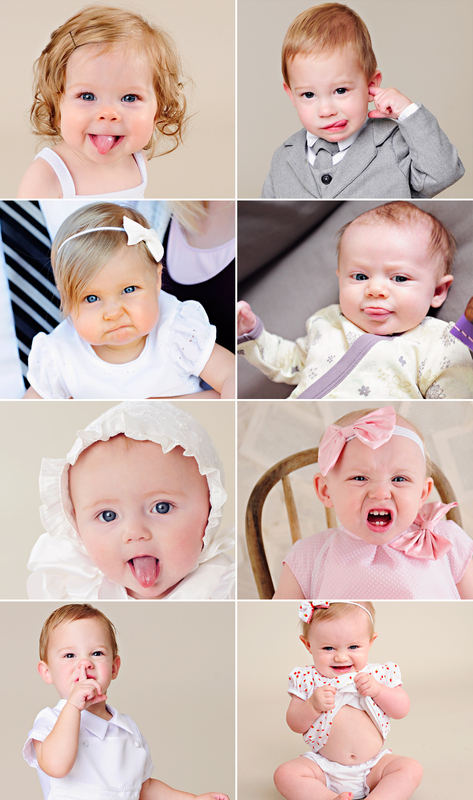 Aren’t these silly faces too cute to boo? 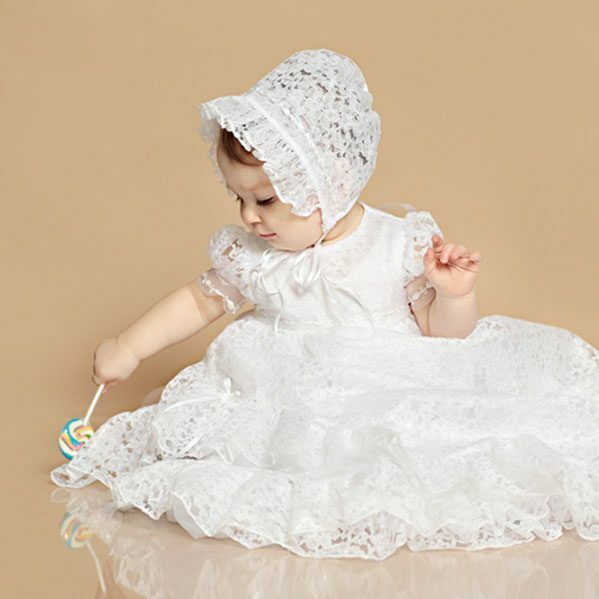 The Demi Dress is a circle skirt christening dress. But the possibilities don’t end there. 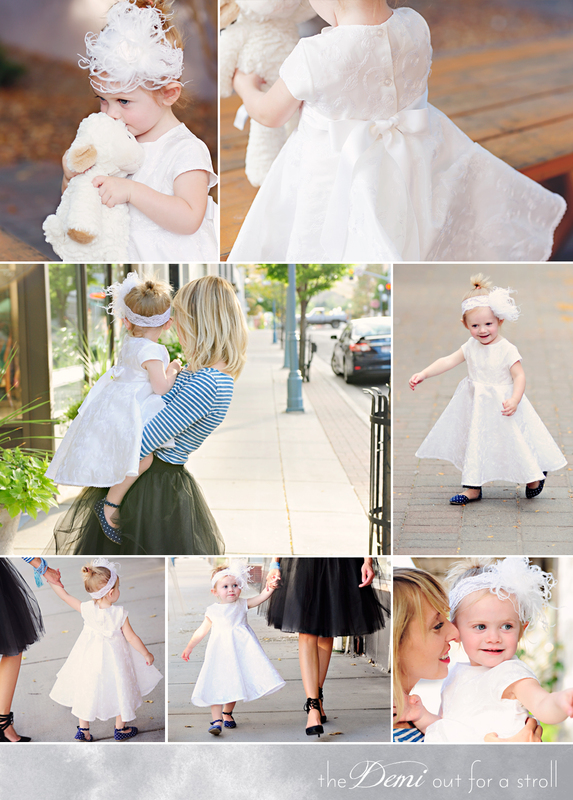 Use this classic dress for first birthdays, flower girls and holiday celebrations. It’s the perfect look for your little on any occasion. A simple silhouette allows all the details of the elegant embroidered taffeta take center stage. The Demi design features dainty cap sleeves and a mid-calf “tea” length. A tasteful lace trim graces the edge of the skirt. A double-faced silk ribbon sash ties above a row of buttons on the back of the dress. As shown above, the Demi Dress looks great paired with a statement headband and bold accessories. 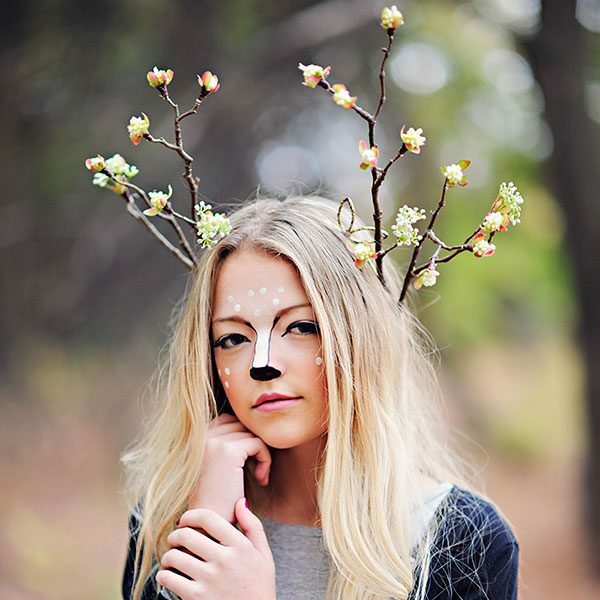 The model is wearing our Tallie Rosette Headband. So adorable! We know you’ll love the Demi Dress! 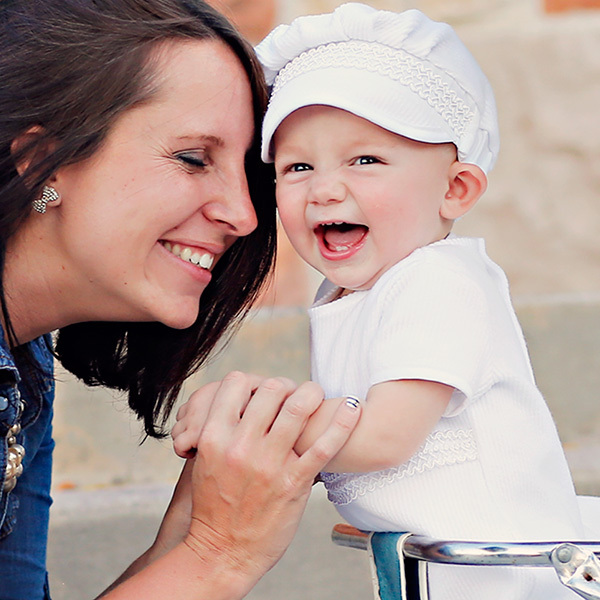 We’re highlighting an adorable little one today. 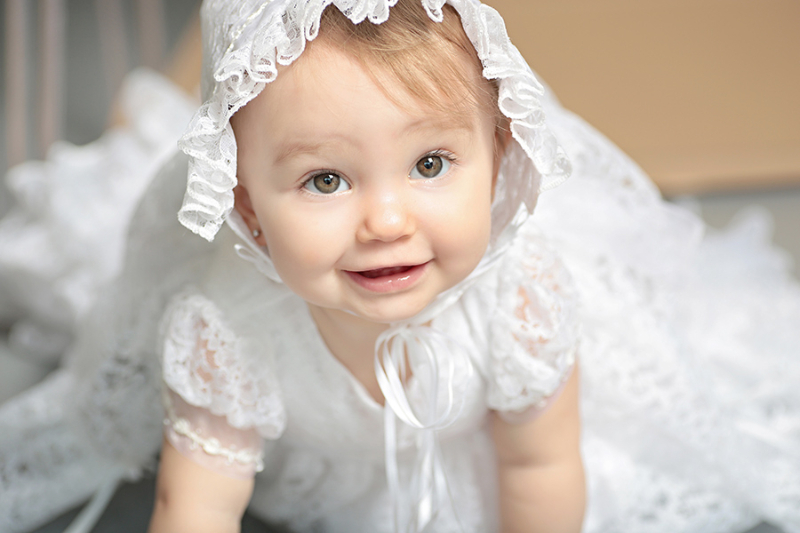 She’s wearing our fancy Lucy Christening Gown. Read all about her special day below. How did you find One Small Child? I found One Small Child with a Google search. It was one of the first links that caught my eye. Was the purchasing simple and hassle-free? Purchasing from One Small Child was very simple, with no hassle at all. 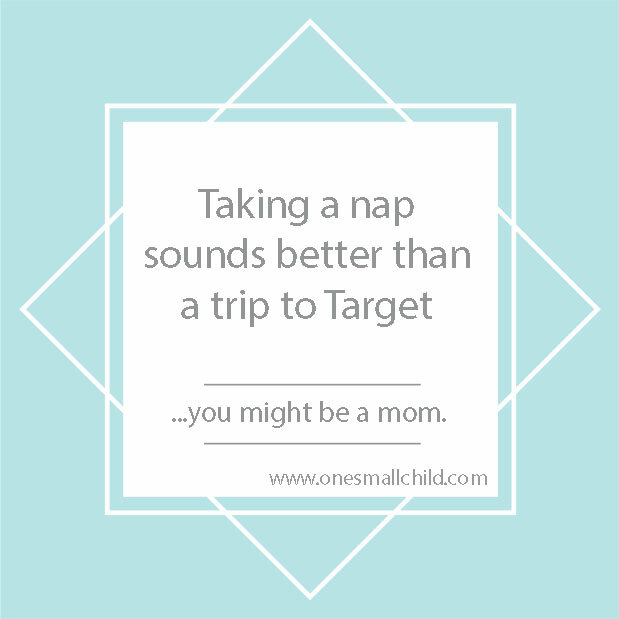 I was also able to have a great conversation with an associate of One Small Child prior to purchasing. Communication was simple and hassle free as well! What did you look for in a photographer? Since I am a photographer, I did the photos of my daughter. 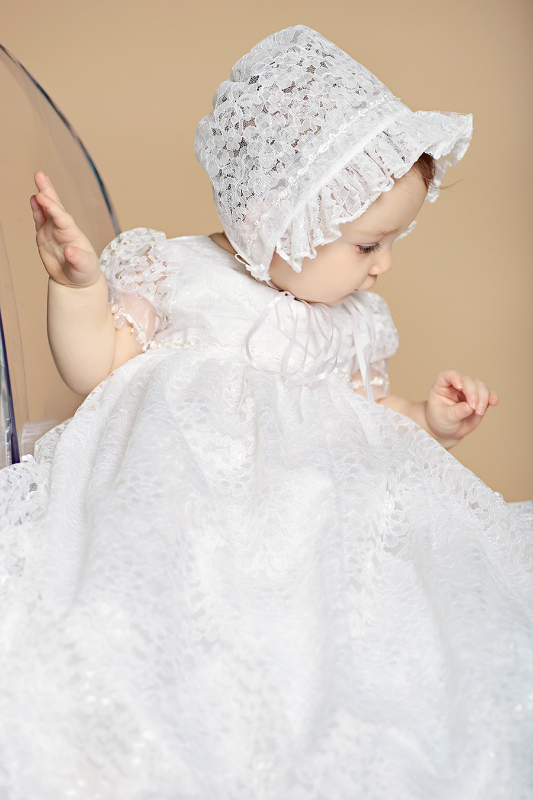 I was going for a clean, minimal look that captured the beauty and sweetness of my daughter as well as the lovely gown and bonnet she was wearing. What images of your event were important for you to capture? We just had someone take some snapshots during the actual ceremony. The baptism took place during mass. We were able to get some shots with big brother, who made his First Communion that day as well. 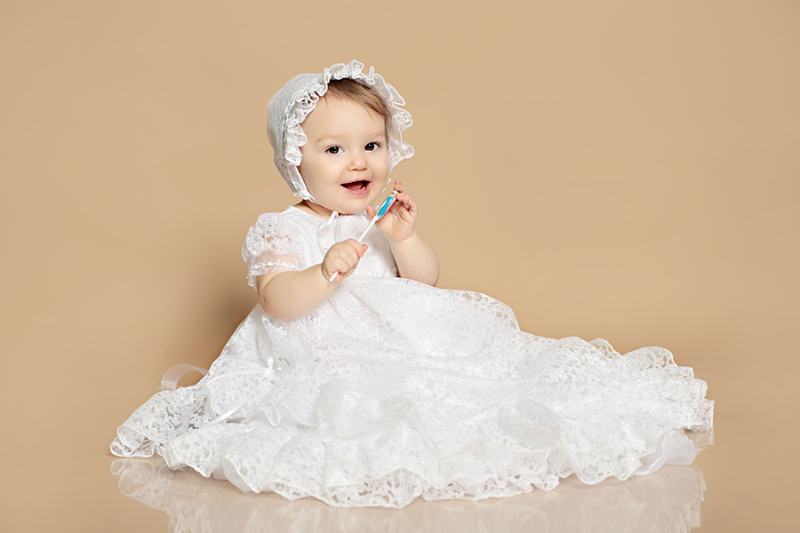 What was the planning process like for your little one’s big day? 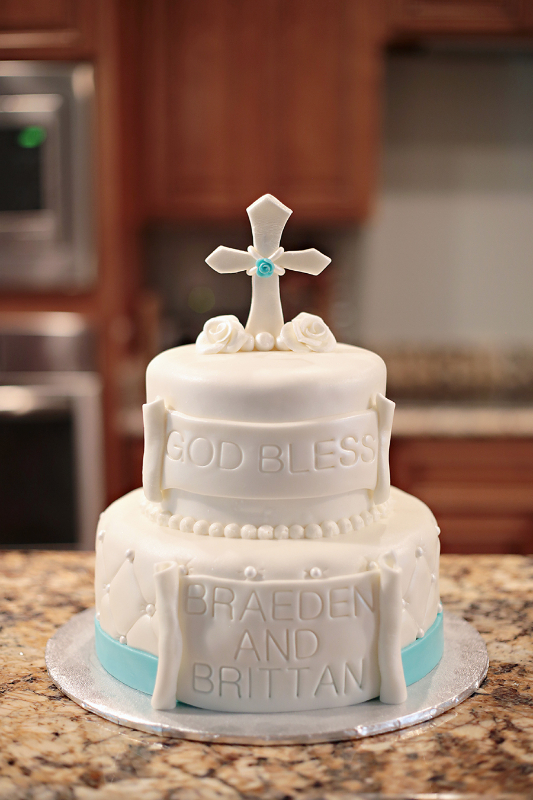 We spoke with the church committee and planned to do the baptism during mass, the same day my son made his First Communion, as we had family in town visiting. It was quaint and quick…but very special. The biggest task was finding the perfect dress-and One Small Child made that easy! What did you want it to feel like/theme to be? We wanted to have a simple service without stress. We had just built and moved in to our first home a week prior, and Daddy was getting ready to leave to go overseas. The less complicated, the better for us! Did you provide a meal to friends and family afterwards? All of our close friends and family went out for the evening to Olive Garden for dinner. It was nice to relax, celebrate, and not have to worry about catering the party. I also had a gorgeous, yummy cake made for dessert! Was there a particular moment that was memorable on that day aside from the event itself? It was a wonderful feeling to have all our friends and family together to celebrate. Simply put, felt very blessed! Are you going to preserve and/or frame your babies’ gowns? I plan to get the gown preserved this month. I am hoping that one of my three children will want to use it for their daughter one day. Looking back, was there anything you would do differently? We love to hear your stories! They truly inspire us! If you are interested in being featured on One Small Child customer highlight, please contact us by email: [email protected] We look forward to hearing from you! An ornately embroidered satin-silk bodice is absolutely stunning. This luxurious fabric has all the charm and rich pearl color of silk. It offers the beautiful sheen of muted satin. You’ll love the silky-smooth feel that only a combination of these materials could provide. We topped the satin-silk with layers of re-embroidered lace netting, in the same pearl tone. This lavish material has character! The re-embroidery offers a pronounced texture, found in only the finest of textiles. It offers all the simple charm of an old-world heirloom. The bodice features ornamental embroidery. flanked with lace. The three-tier ruffle sleeve is suitable for any season. A slight gather provides an appropriate skirt volume. Symmetrical sweeps reveal yet another layer of exquisite lace. Generous ruffles finish the sweeps and hem of the gown. Hand-gathered silk trim offers extra decoration. Silk-covered buttons neatly secure the back of the gown to part-way down. This offers gown presentation ease. From the lace collar to the over-stated hemline, this gown is timeless. Each Royal gown is hand-crafted with love. Special care is taken to construct your gown with beauty and durability. We’ve selected only the finest materials. Our most experienced seamstresses work to give you a gown worthy to be passed from generation to generation. 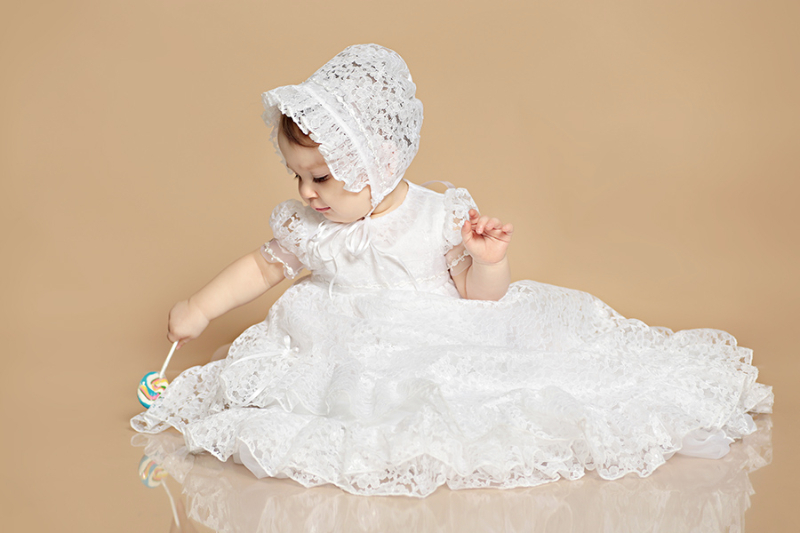 Along with the gown, you’ll receive a matching bonnet, cotton slip and preservation bag. 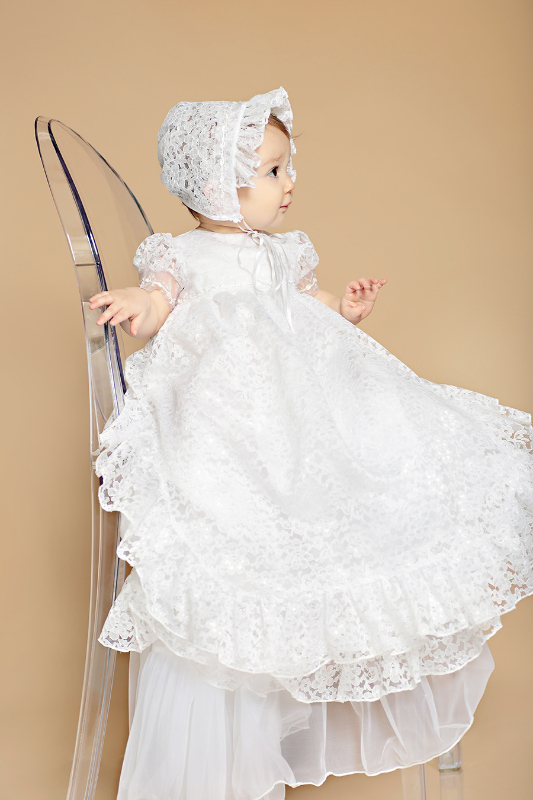 The matching bonnet has two tiers of lavish lace and shimmery silk ribbon ties. The slip is made from combed cotton broadcloth material. It’s both comfortable and durable. A thick ruffle with generous gathering provides subtle volume to the bottom of the gown. This helps preserve the gown’s shape throughout the skirt. Our muslin preservation bag with padded hanger provide the proper environment for garment storage. Ultra-soft combed cotton rib knit makes up the main element of this comfortable style. It’s absolutely heavenly to the touch! Your little angel will feel like he’s wrapped in a cloud of warmth in this comfy outfit. A glossy braid trim is featured on the chest of the romper. It also studs the jacket and accentuates the cap. Fabric-covered buttons close the jacket and act as a trim on the hat. The romper has buttons in the back and convenient snaps down the legs. 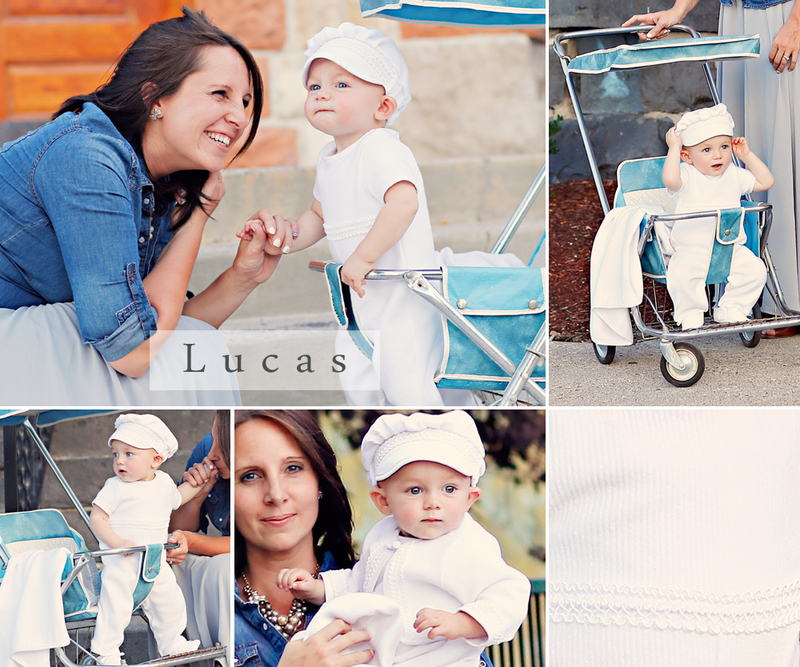 A matching Lucas blanket will add more sublime comfort to his special outfit. The Lucas shoes are a soft-soled crib bootie. They’re fully lined with ultra-soft cotton flannel and decorated with matching trim. The Lucas blanket and shoes are sold separately. As always, all items are proudly made with love in our local workshop, right here in the USA. Looking for a festive outfit for all your upcoming holiday fun? Our Kira is a classic navy party dress for baby girl. Perfect! 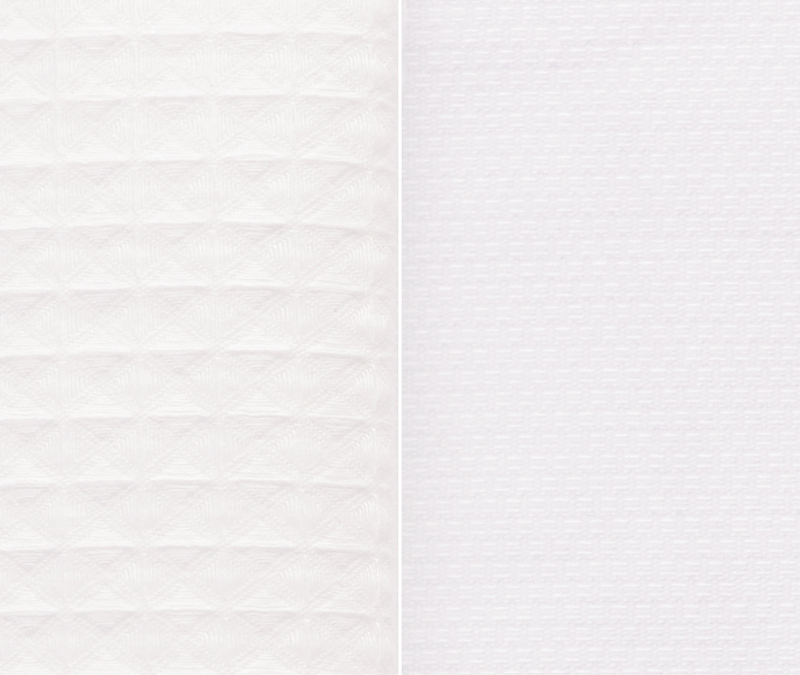 The Kira is made from only the best of textiles. The luxurious dupioni silk is a rich shade of midnight navy. A classic design of puffed sleeves and a simple bodice. A pearl white silk ribbon sash adds interest to the waistline. It’s decorated with a pouf of tulle and a sparkly button. A full skirt is subtly gathered at the waistline and ends below-the-knee. It’s just the right length for your wee one. A matching headband is included in this 2-piece set. Two handmade silk rosettes are accentuated with raw-edge boughs of tulle. A spray of beads and a shimmery button add a little glam. All this is nestled atop a wide, stretchy lace band that’s soft and comfortable. Cotton: The cotton (upper left) we use most is a broadcloth weave cotton. A broadcloth is a fine, tightly woven plain weave with a faint rib. Usually of cotton or cotton blend, but can be made with any fiber. Our cotton broadcloth is made from 100% cotton. 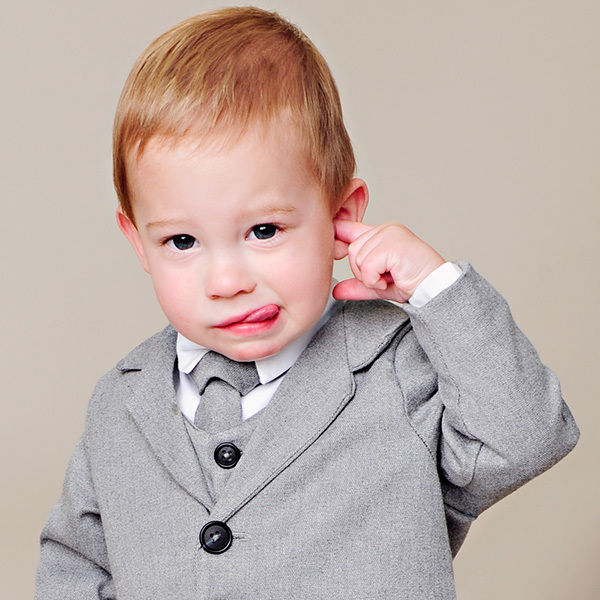 Many of our boy’s outfits are made from cotton broadcloth, including the Daniel Outfit. Satin: Our matte satin is a bridal quality textile. Satin is a weaving process that causes light to reflect off diagonally “floating” yarns, rather than being absorbed by the regular perpendicular intersections of yarns found in a plain weave. Satin can be made from any fiber, is smooth and tightly woven, and comes in many weights and degrees of shine. Our matte satin is a mid-to-heavy weight pure white polyester product with a “de-lustered” surface. That means it has a soft, rich glow rather than a glaring shine. Our Olivia Gown is a gorgeous display of satin. 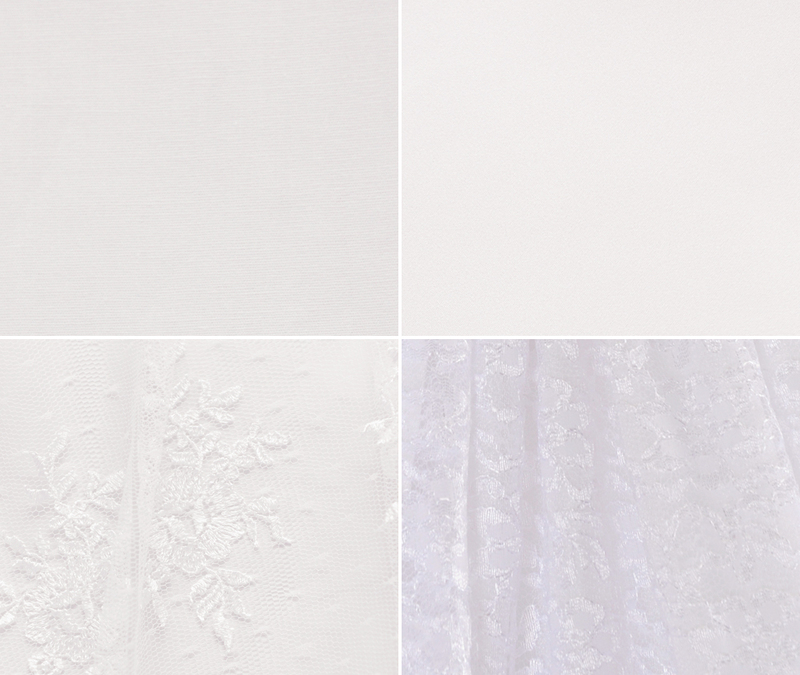 Netting/Lace: Netting (lower left) or Lace (lower right) is a very delicate, open, and light fabric. It’s created by twisting, knotting, or weaving threads together at regular intervals. Our Memory and Lillian gowns are made from gorgeous embroidered netting. 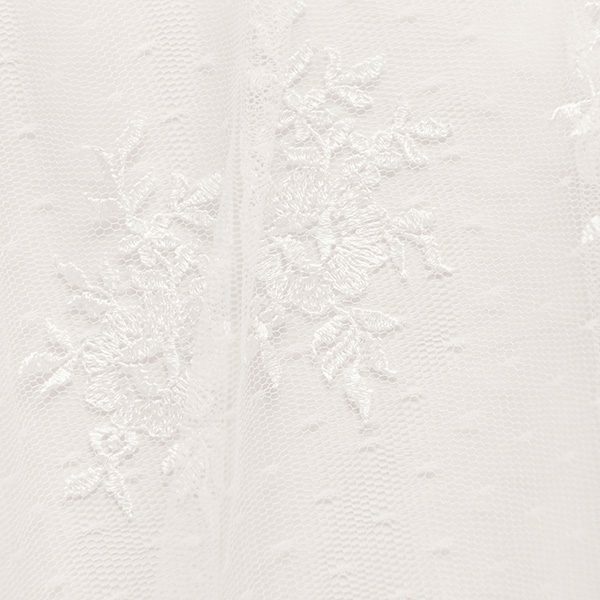 Our Lucy Gown is made from the pretty floral print lace that is pictured above. Organza: Organza is a plain weave fabric made of tightly twisted yarns in a sheer, light weight. It has a crisp finish and can be constructed of any number of textile fibers. Ours is 100% polyester and has a soft luster. Our Clarice Dress is made from organza. Shantung: Shantung is woven in the same manner as dupioni (see silk dupioni description below), creating the same overall textured effect of the silk product, but utilizing man-made polyester fibers rather than natural silk yarns. 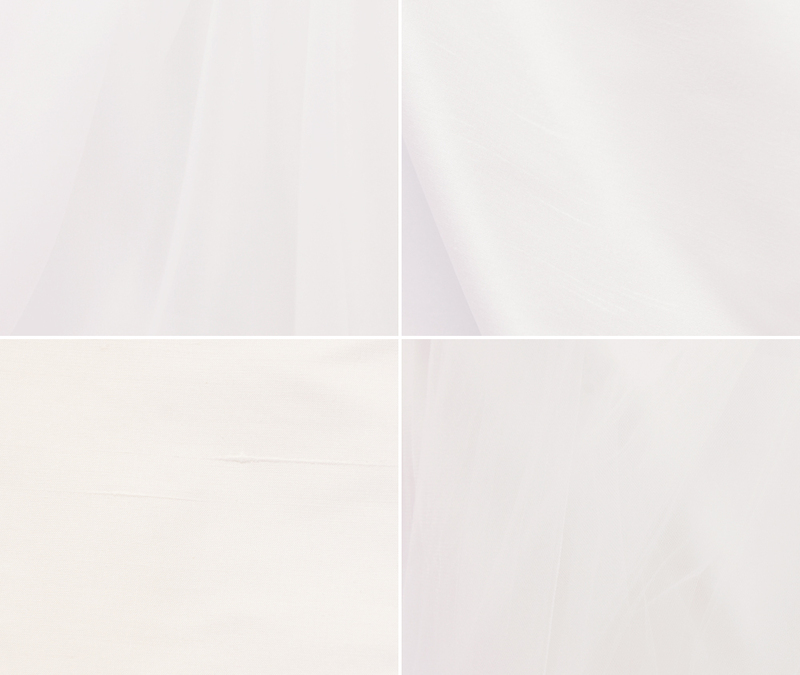 Our shantung is bright, pure white in color. It’s a medium weight, and has a soft luster on the surface. For example, the Jonathan Outfit is made from shantung. Silk: We use a silk called dupioni. It’s a subtly textured fabric woven from a double strand of silk yarn in a plain weave pattern. The yarn is uneven and varies in width, creating a series of natural horizontal “slubs”, which should not be considered flaws, as they make up the unique character of the textile. Our silk dupioni is “pearl white” in color (a shade between white and ivory), is light to medium weight, and has a crisp finish with an understated sheen for an overall luxurious appearance. The Francis Romper is an example of our silk outfits. Tulle: Tulle is a sheer net in a hexagonal mesh pattern (see netting description above). It has a light to medium stiffness and is often made from silk, rayon, cotton or nylon fibers. Tulle is most commonly used in formal wear, veils and costuming. If you love the look of tulle, you’ll love our Shanna Gown. Cotton Piques: Above are the two pique fabrics we use. A pique is a textured weave, available in many different patterns: vertical, horizontal or diagonal rib, birdseye (small diamonds), waffle (small squares), honeycomb, or wave. Usually tightly woven and constructed of cotton or cotton blend fibers. The waffle pique (above left) is used in our Austin Outfit. You can learn more about all of our fabrics in this article on our website. Now that you have more fabric information, you can choose from our high-quality selection based on your personal preference! Happy shopping! Gorgeous embroidery and intricate beadwork graces tulle lace and rich silk. 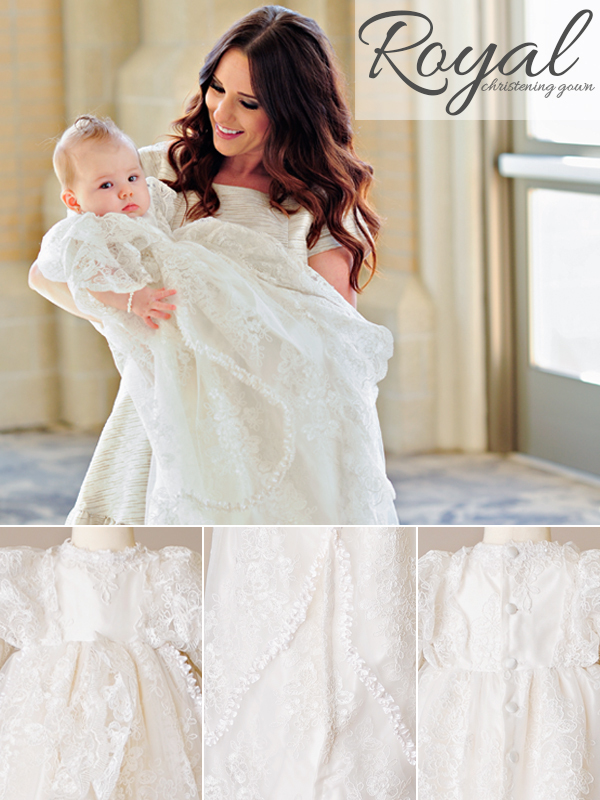 The Preslee Silk Christening Gown is simply stunning! The Preslee is an extravagant event gown made from 100% silk dupioni. Dupioni is a subtly textured fabric in a plain weave pattern. The yarn is uneven and varies in width, creating a series of natural horizontal “slubs”. These “slubs” make up the unique character of the fabric and offer a rich feel. The Preslee’s silk is a pearl white color. It’s a rich, creamy shade between white and ivory. The silk is overlain with stunning embroidered tulle lace. This tulle lace is a sheer net in a hexagonal mesh pattern. It is a light, flowing fabric. Pretty embroidered flowers are elegantly scattered across the tulle. Each features a delicate bough of beads, hand-sewn in place. The bodice features a scalloped-lace overlay, a lustrous double-face silk ribbon sash, and stunning silk rosette. 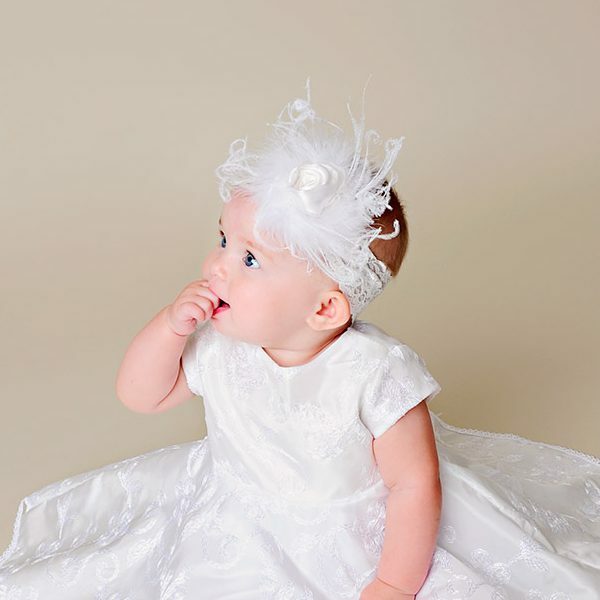 The beautiful rosette is hand-finished with a spray of ostrich feathers and three freshwater pearls. A matching rosette piece is placed on a wide, stretchy-lace headband. The bodice boasts feminine puffed sleeves. A soft cotton slip is layered beneath the Preslee. It features a generous ruffled hem that adds a touch of body to the skirt of the gown. Personalize the slip with a name and date embroidery for a special touch. The Preslee Gown comes as a four-piece set and includes: the gown, a matching headband, the ruffled cotton slip and a muslin preservation garment bag. Add all the separate co-ordinates: the Preslee Slippers, the Preslee Blanket and the Preslee Bib for a complete look. 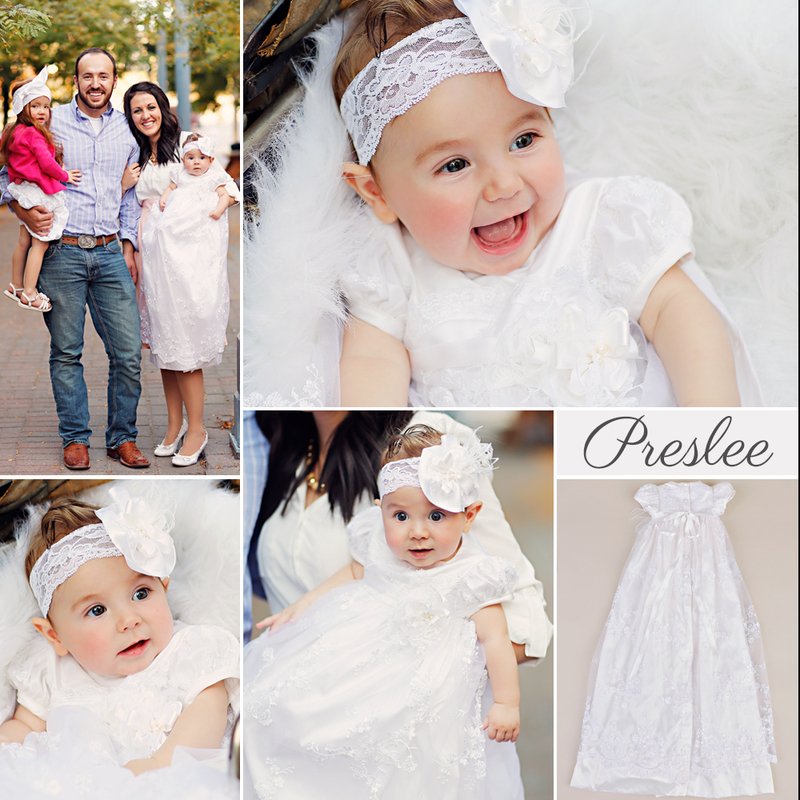 As always, the Preslee is handcrafted, with love, in the USA of imported fabrics. 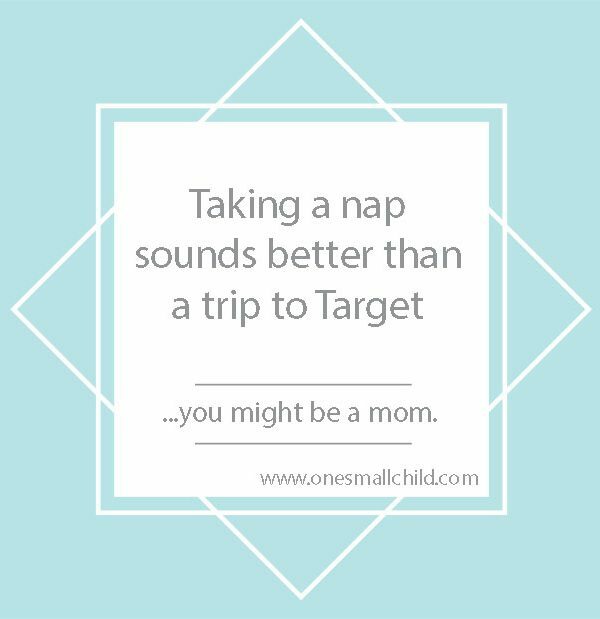 Take a Nap or Trip to Target?